Well, it's November and the October Unprocessed challenge from Eating Rules is over. 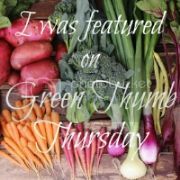 I am so happy that I took this challenge publicly, not just in the blog world but I told my family, friends and colleagues about it as well. I got tons of support from everyone I care about. Though I had a few slip ups, like eating candy on Halloween night, I still felt positive change. As in, I didn't stock the house with candy and eat it all month long. And you know what? I didn't miss the candy either. I lost 3.5 lbs without even trying, without limiting portion sizes. I'm a girl who likes to eat. I really want to keep some parts of the challenge and see them as realistic for my lifestyle. For example, homemade bread with the bread machine is simple. However, there are some processed foods that I'm welcoming back with open arms. I really missed bottled salad dressing, ketchup, barbecue sauce and the like. I also missed the occasional iced tea, since I don't drink coffee or tea or anything except water really, iced tea is a nice treat for me every now and then. What I won't be bringing back are diet soda, packaged snacks like granola bars or cereal bars, pretzels, packaged side dishes like flavored rice, or dry cereal. I do believe in using moderation, so those items aren't gone forever, but they're not going to be as common in my diet as they used to be. 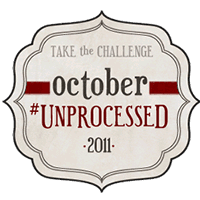 Did you do the October Unprocessed Challenge? How did it go? I wound up not really following it, but I was making my own bread for quite a while. The good things and the bad things of city living all in one activity: eating out!